Only a few months ago, Laloo Prasad Yadav, president of the Rashtriya Janata Dal, and Ram Vilas Paswan, president of the Lok Janshakti Party, were sworn enemies. The two not only did not talk to each other, they lost no opportunity to run each other down. As members of the delegation of parliamentarians that visited Pakistan last year on the invitation of the South Asian Free Media Association, the two Bihari leaders sought to constantly upstage each other. Yadav became an instant hit in Pakistan while a peeved Paswan sulked as the hosts almost ignored his presence. It was then that Paswan tried to attract attention by proclaiming, without provocation, at every forum, including on television, that he was the only minister in the Atal Bihari Vajpayee government who had quit in protest against the Gujarat riots. Yadav, of course, pooh-poohed the claim, insisting that Paswan quit once he was shifted out of the communications ministry. Indeed, so fierce was the Yadav-Paswan rivalry that at a meeting with President Pervez Musharraf Paswan showed his pique at being downgraded in the seating arrangement while Yadav was accorded pride of place. When the general got himself photographed separately with Yadav, even joking that the latter was so popular in Pakistan that he could win a presidential election there, Paswan insisted on having his own photograph taken with the dictator. The general duly obliged Paswan, causing Yadav to snigger at his fellow Bihari's obvious jealousy. But much water has flowed down the Indus since those days. 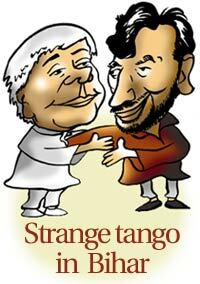 Today, you find Yadav and Paswan in an electoral embrace in Bihar, making for a most unlikely jugalbandi. Overnight the RJD chief has become so generous towards his erstwhile rival that, setting aside old suspicions, he has allotted him twice the number of seats he has given the Congress, a long-time and trusted ally. The reason for this newfound love: cold electoral arithmetic. In Bihar's caste-ridden politics, Sonia Gandhi will not fetch the RJD-led alliance the votes of the dominant castes, which are with the Bharatiya Janata Party-led National Democratic Alliance. But Yadav reckons that Paswan would attract Dalit votes to make the Yadav-Muslim-Dalit tie-up a winning combination. Never underestimate the power of electoral politics! Balbir Punj, BJP member of the Rajya Sabha and close aide of Deputy Prime Minister L K Advani, was a guest of West Punjab Chief Minister Pervez Elahi when he visited Lahore recently to witness the Limited Overs International match between India and Pakistan. While a couple of Indian ministers present for the final were kept away from the presentation ceremony at the end, Punj got a ringside perch with Elahi so that he could be seen prominently in the picture frame on subcontinental television sets. Elahi and the ruling Pakistani establishment probably felt that Punj's proximity to Advani and the RSS leadership would come prove useful at some stage. Punj, who was also on the parliamentarians' delegation that visited Pakistan last year -- yes, the same one on which Laloo Yadav and Ram Vilas Paswan had such fun -- was felicitated by the Pakistani establishment and thoroughly enjoyed all the attention. And as if to prove that he was no ingrate, as soon as he returned from Lahore late last month he sought to persuade Advani and others in the Sangh Parivar that General Musharraf and others around him are sincere in pursuing peace with India. If only ossified mindsets in Islamabad could change as easily as the attitude of stray Indian visitors who get to enjoy the legendary hospitality across the border. Local leaders of the BJP-RSS are none-too-happy with the nomination of former prime minister Inder Gujral's son Naresh as the Shiromani Akali Dal candidate for the Jalandhar parliamentary constituency. The senior Gujral had piggybacked on others all through his political career, and BJP leaders are reluctant to campaign for his son who, they say, had nothing to do with politics till he jumped into the fray, thanks to the misplaced magnanimity of Akali Dal chief Parkash Singh Badal. A couple of weeks ago, when a senior BJP minister in the Vajpayee government visited Jalandhar, he was cornered by angry party workers protesting against the choice of candidate and threatened not to work for his success. But the minister pacified them, pointing out that Naresh Gujral contesting on a SAD ticket marked a triumph for the combine. How, you wonder? Well, remember how the senior Gujral always tomtomed his 'secular' credentials? "As the joint candidate of the Akali Dal-BJP combine, he and his son have implicitly endorsed both the Anandpur Sahib resolution and the Ram temple campaign," the minister claimed. The shrewd comment defused a potentially sticky situation for the minister. The BJP has come a long way from the days when Atal Bihari Vajpayee was but one of its many leaders and the party boasted of functioning in a democratic manner, taking all decisions through consensus rather than by edicts from someone on high. In the late 1970s, Nanaji Deshmukh, then organising secretary of the Bharatiya Jan Sangh, predecessor of the BJP, had publicly declared that Vajpayee was not the arbiter of the party's affairs. But it seems a stint in power has been enough to transform Vajpayee into the sole leader a la the late Indira Gandhi in the Congress. If you have any doubt, just take a look at the BJP's 'vision document.' The manner in which the party manifesto has been transformed into 'Vajpayeenama' proves that the personality cult has come to afflict the Sangh Parivar as well. To be fair, the fault does not lie as much with Vajpayee as with those close to him, who feel obliged to pound his drum as they have benefited greatly from their proximity to him. The draft document that was sent to Vajpayee for his approval bore no resemblance to the one that was released by party president M Venkaiah Naidu on March 30. It was virtually rewritten by a journalist in the prime minister's office and made wholly Vajpayee-centric. To push the point that 'Vajpayee is BJP and BJP is Vajpayee' further, they inserted 54 photographs, no less, of the Great Leader in a document of 52 pages! The deification of the great helmsman was complete, though once the document was released and attracted adverse comment for the vulgar attempt at promoting Vajpayee, the very people responsible for it were at pains to deny that this was their handiwork. The rate at which Bollywood stars, minor and major, have jumped into the political fray, an enterprising producer might profit by making a film exclusively with film star MPs. Vinod Khanna is seeking to re-enter Parliament for the third time from Gurdaspur in Punjab. Hema Malini, Shatrughan Sinha and Dara Singh are already in the Rajya Sabha. Dharmendra, who followed wife Hema into the BJP a few days ago, is seeking to make his maiden entry into the Lok Sabha from Bikaner in Rajasthan. The Congress has Moushumi Chatterjee in Kolkata Northeast and Govinda in Mumbai North. But in the midst of all this starry activity, the BJP which swears by Bharat that is India seems to have forgotten Mr Bharat himself. Veteran Manoj Kumar, who joined the party a few days ago, was keen to contest the election but was not even considered for a ticket. A desperate Manoj Kumar put calls through to senior party politicians, including BJP president M Venkaiah Naidu, to complain that the BJP has "no ticket for 'senior artiste' Manoj Kumar, but a ticket for 'junior artiste' Dharmendra"! If only politicians knew the pecking order in Bollywood!